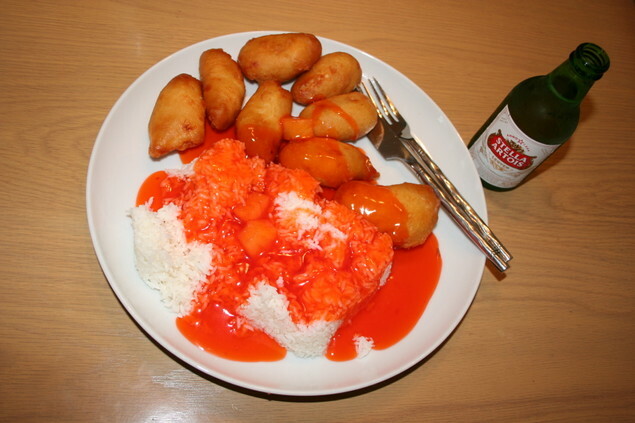 Sorry, this isn't the golden fried chicken nuggets and bright red, sugary sauce of Chinese take-out's familiar sweet and sour chicken (as pictured below). Below is my attempt at a healthy version. I was really pleased with it, personally. I liked it better than the too-sweet take-out version. Johnny's partial to the "real deal," since this is his favorite menu item. But as a healthy substitute, he admitted it was good, too. Cook your preference of rice according to package instructions. In a medium stock pot, add the pineapple juice, ketchup, vinegar, soy sauce, ginger, and garlic powder, whisking to combine. Wash and cut the green pepper and add to the pot. Bring to a simmer, and cover. Salt and pepper your chicken breast and cook until done. A little sear on the outside will add an extra layer of flavor to the dish. Cut into bite sized pieces. Thoroughly combine the corn starch and cold water. Slowly whisk into the sauce, avoiding any lumps. Add the pineapple tidbits and return the cover, letting it return to a simmer to thicken. Serve the chicken and sauce over the rice. Make sure to scoop plenty of the peppers and pineapple pieces over top, too. Serves 4-5. As I said above, I preferred this version because it was more savory. The ginger, garlic powder. and rice vinegar added some great depths of flavor to the sauce and the only sweetness you get is from the pineapple's inclusion. There's a bit more "tang" than "sweet," which is how I think it should be. A great weeknight dinner to replace a night you would have had take-out. Save yourself a few (hundred) calories and make this version! what a great new way to cook it - it looks delicious! I LOVE your version of sweet and sour so much better than that neon orange stuff! Yours looks tastier and healthier - and more normal ;) Great job converting a sugar-loaded takeout item to a quick healthy dish, Christina! That looks so yummy. (I made a similar sweet and sour pork last week) My husband is the same, he prefers the deep fried, msg filled take out, but, was happy to eat the home made just the same. Have a great day. Chinese food actually scares me, I think due to the fact that I am not really sure of what's in it. But hey, if I can make it homemade, I'd be all over it! Yours looks great!